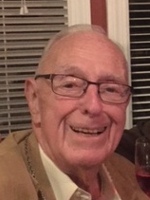 ALBANY – Leo P Dean, of Albany passed away peacefully on Saturday Dec 12, 2015. Leo was employed at Norvest Financial Services as Executive Vice President since 1991 as an Insurance Consultant. Graduated from CBA Christian Brothers Academy in 1941 and after taking a few business courses went on to work for the Texaco Co at the Port of Albany. At 17 years old started at General Electric in Schenectady working on IBM machines that used the punch card system, the beginning of computers! December 7, 1941 the world changed when the Japanese attacked Pearl Harbor. At age 18 in 1942 he registered for the Draft, always wanting to be a soldier and by 1943 volunteered for the Parachute Troops. Spent almost 3 years with his beloved 517th Parachute Infantry Regimental Combat Team. Saw action in Italy, Southern France and the famous Battle of the Bulge in Belgium. Was Honorably Discharged in November 1945 and transferred to the 105th Infantry, 27th Division of the New York National Guard. Served as an Enlisted Man, a Warrant Officer and a Commissioned Officer. Transferred to the Inactive Reserve in 1952. Leo was also a Sharp Shooter and could still hit the bullseye at 90 years old. Leo received the highest Honor given to a Soldier from France, the Legion Award. He received a Bronze Star from the President of the United States in 1950 for his service in WWII. He later went to Siena College in Loudonville NY under the GI bill for Veterans. Started Jan 1946 and graduated June 1949 with a BBA with a Major in Accounting. Soon thereafter worked in Albany for the James B. O’Brien, Inc. Insurance Agency/General Agency for the Berkshire Life Insurance Co of Pittsfield, Mass. After WWII Leo was active with the American Legion, Post Finance Officer then Vice Commander. After the Military, he married his beloved Helen Hart of Waterford, NY in June 7, 1952 and bought their first home in 1955 there. While in Waterford, he served as Chairman of the Waterford Taxpayers and Rentpayers Association. Leo also served as Secretary to the Board of Water Commissioners until 1979 when they moved to Albany. It was in Albany that the Mayor recommended to the Governor that Leo be appointed to the Albany Port District Commission and was also appointed to serve on the Albany Water Board, which he served on both up until his passing. During periods of those years, Leo served as Chairman of the Heart Fund Drive, a Representative of St. Mary’s Church on the Albany Diocese Advisory Committee and Albany Association of Life Underwriters. He was an active communicant of All Saints Church under Father Tom in Albany NY up until his death. “You should always be involved in 3 things: Not necessarily all at the same time – No matter what your business or profession, you should participate in activities with others of the same. You should do something for your Community. Do something for your Church or Synogogue. Leo donates every year to CBA and to Siena, In 2004 made a Charitable Gift Annuity to Siena College giving a Name on a Dormitory in McCloskey Square as the Dean House. The Plaque on the door lists Leo P Dean 1949 and John R Dean 1956. He was predecease by his wife who died February 1998 . They were never apart in life and have once again joined each other. Leo used to tell his friends, “I don’t have any vices. I don’t smoke, I don’t play golf, I don’t drink, well, maybe glass of wine occasionally.” So after Helen died, he took up a new hobby….Skydiving. He said he no longer had someone to tell him what to do and where to go. So now he does it “HIS WAY”. Every year Leo returns to Southern France to celebrate with WWII Re enactors the Liberation of Southern France. He returns to his French friends and travels with his dearest Friends and WWII Comrade, Allan Johnson, age 91 and his daughter Claire and Jim Giblin. Leo recently spent last August in a French hospital and can truly say that they saved his life there. As of 2015 Leo has over 167 Skydives between France, California, New York and Florida. He did get up at Level 3 three times. Survivors include his niece Elizabeth Dean of Pleasant Valley, her son Michael Siefert of Northfield, Mass and his niece Patricia Dean also of Pleasant Valley, NY. Leo enjoyed his Thanksgiving Holidays with them and looked forward to creating many memories there. He is also survived by several cousins. Survived by his adopted family, Renee Farley , her children Desiree, Ian Farley all of Malta NY Shannon Vosburgh of Marco Island and his adopted grandchildren, all of Florida all of whom he has skydived with. Leo led a full and complete life with his family and friends. He was the Glue that bonds us together. He was loved by so many in the community and he has loved us all so unconditionally. He served our country and am sure we all agree ……that to be touched by Leo P Dean in this lifetime…..was truly a blessing. Funeral services will be held in the Hans Funeral Home, 1088 Western Ave., Albany, Thursday morning at 8:15, and from there to All Saints Catholic Church, 16 Homestead St., Albany (behind CVS) at 9:00am. Relatives and friends are invited, and may call at the funeral home Wednesday from 4-7 p.m. Interment will be in St. Mary’s Cemetery, Waterford. To leave a message of condolence for the family or obtain directions to the funeral home, please visit www.HansFuneralHome.com. Click here to view Leo’s resting place in St. Mary’s Cemetery, Waterford, New York. So saddened to hear about Leo. He truly was one of the greatest man I had have ever known I will always remember his great stories, his no vices joke, watching him jump from planes and his charming smile. Rest in Peace Leo, you truly left your mark! Blue skies, Leo is flying with angels. What a great guy, I’m honored that I got to know him. My sympathies to his family and all of his friends. we sure had fun skydiving with him! He was a great man and will be missed but never forgotten. God Speed Leo! We are really saddened to hear that Leo is no longer with us. He was an extraordinary man. We are so fortunate that we had an honor to know Leo and were able to hear some of his many stories. There are many in the community who will mourn deeply his passing as he was full of life, love, compassion and excellence. May he rest in peace. We extend our deepest sympathy to Leo’s family. May your hearts be filled with wonderful memories of joyful times together as you celebrate a life well lived. I had the chance to share a moment with Leo last year on Le Muy drop zone. I’ve been impressed by that toughful, funny and deeply human “little big man”. A true soldier and paratrooper. All his french friends are orphans. God bless you Leo ! I had the privilege of enjoying Leo’s acquaintance over many luncheons at Albany’s LaSerre in the 1990s. A true gentleman. in Troy. I was recovering from Achilles Tendon surgery. I was down. Godspeed, Leo ! Leo Dean. Whenever I heard his name it brought a smile to my face! I met him through the 517th family that he was so proud of. (If you want to know more about Leo and his association with the unit he served with in WWII, you can visit this website: 517PRCT.org) There is a tribute to Leo on that website. He was fun to be around and I was fascinated by this man who lived a great life! Thanks, Leo, for being you. It has been, truly, a blessing to have known Leo Dean. He is gone but will never be forgotten. For those of his immediate family, I offer my sincere condolences. Leo, You and your finances will be sorely missed by the Farleys.